Home » Blog » What Are the Best Treatments for Scarring? Scars happen to nearly all of us, whether because of acne, surgery, an accident or disease. The raised or sunken marks are reminders of the body’s ability to repair itself. Although cosmetics can temporarily conceal the appearance of some scars, it’s understandable that people with prominent or disfiguring scars may want a more permanent solution. Here, Dr. Jonathan Grant, a facial plastic surgeon in Mt. Vernon, discusses two treatments that he recommends to his patients that want to minimize or erase noticeable scarring. Dermabrasion is an extremely effective way to minimize raised scars and some types of scars from previous surgeries, accidents and diseases. Treatment involves using a special instrument to gently refinish or polish the top layer of skin so it is smoother and more even. Treatment can be performed in Dr. Grant’s office on an outpatient basis. Local anesthesia may be used to numb the area for a comfortable experience, and the area is cleansed. Dr. Grant uses a handheld instrument (a medical grade rough-edged diamond wheel) to gently scrape away the most superficial layer of affected skin. He continues to scrape the scar tissue in a controlled manner until he gets to a level that will make the scar less visible. 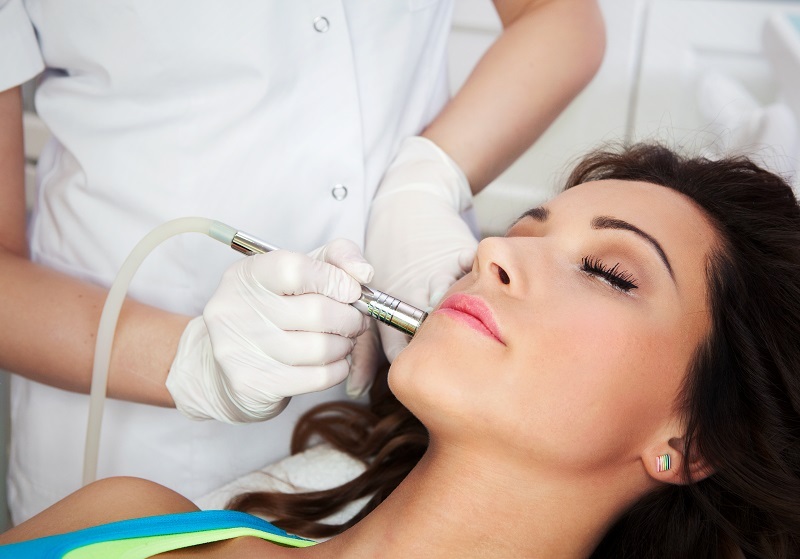 After dermabrasion, the treated area will appear red, bleed and it may scab or crust as it begins to heal. The dermabraded area will need to be covered with topical ointment like Aquaphor or Vaseline. A new layer of tight skin should form within a few days. The new skin is usually pinkish or reddish in appearance and should be very smooth and even. Patients must avoid exposing the area to the sun until it completely heals. The pinkness can take about three months to fade, at which point the affected area’s color should match the surrounding skin. Depending on the type, size, location and degree of scarring, scar revision surgery may be the more appropriate treatment option to soften the scar’s appearance. Scar revision surgery involves re-excising or re-orienting the scar so it falls within a natural skin tension line and is less noticeable. Surgery for smaller scars can usually be done in the clinic but larger scar revision procedures are usually performed in a hospital or surgery center setting. Local anesthesia is always injected for patient comfort and IV sedation (like they use for colonoscopies) can be used for larger scar revisions or if the patient requests it for greater comfort. The specific technique depends on the particular scar, but could involve a complex flap closure, W-plasty or Z-plasty to improve the scar length or re-orient it. Broad scars can also be excised and revised as a geometric broken line in certain areas. Dr. Grant can recommend the most suitable approach during consultation. After scar revision surgery, the scar may look worse initially, but fade as the tissue heals. Gradually the scar should appear flatter, smoother and less visible. To discuss your scar revision options with Dr. Grant in person, please book an informational consultation by contacting us today.